"Choose Your Own Adventure" Sues Over Netflix's "Black Mirror: Bandersnatch"
The choice is yours today. You may choose to read this article or click a random link and read a different article. Choose wisely. Way back in the 80’s there were a series of “Choose Your Own Adventure” books. These young adult books would tell a story and then, at a crucial point, allow the reader to determine how the story will unfold. For example, the man character gets to two doors, if you choice door 1, skip to page 88; if you choice door 2, skip to to page 120. Then the story would unfold in different ways. Right about the turn of the New Year, Netflix released a new episode of its “Twilight Zone-like” series “Black Mirror” called “Bandersnatch”. The television show, much like “Choose Your Own Adventure” books allows the viewer to determine what the characters will do by clicking on the remote. The episode had several different endings that was directly the result of choices made by the viewer. Choooseco LLC is the owner of the CHOOSE YOUR OWN ADVENTURE trademark and was not too happy with the product placement of its brand in the episode. In the first few minutes of the movie, the main character refers to a “Choose Your Own Adventure” book. Netflix did not have a license to do so and commence lawsuit. 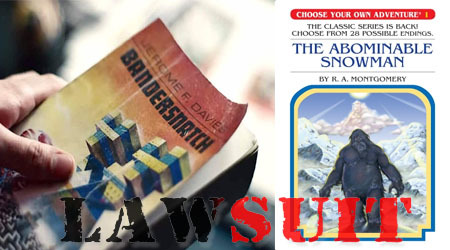 Chooseco claims the the dark and violent themes are too mature for the target audience for “Choose Your Own Adventure” books and therefore it is doing damage to the CHOOSE YOUR OWN ADVENTURE trademark. Here is the whopper, Chooseco claims to have suffered damages in excess of $25 million. Netflix has a very viable fair use defense here. They book was mentioned briefly and did the episode, although it unfolded like a “Choose Your Own Adventure” book did not use the trademark other than for that moment. We shall see if the parties either a) settle or b) litigate. Choices.